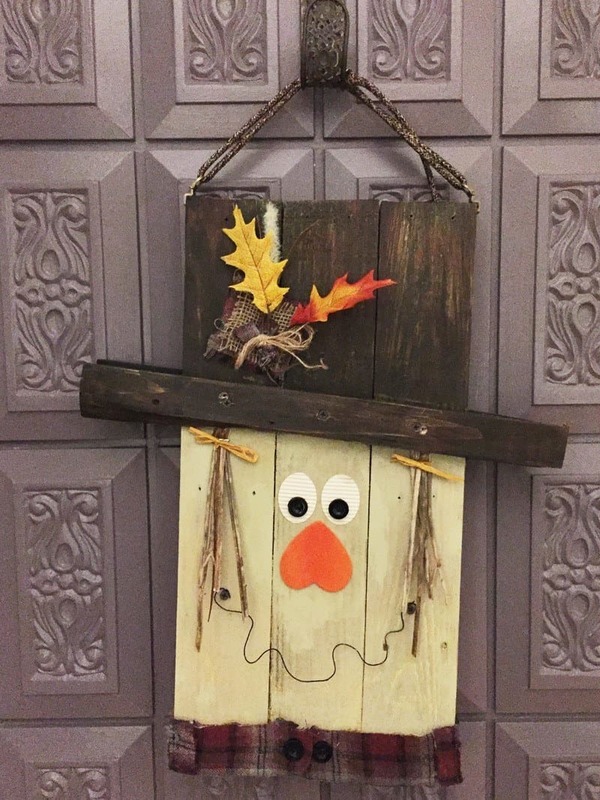 This reversible pallet door hanger features a scarecrow on one side that flips to a snowman on the other side. 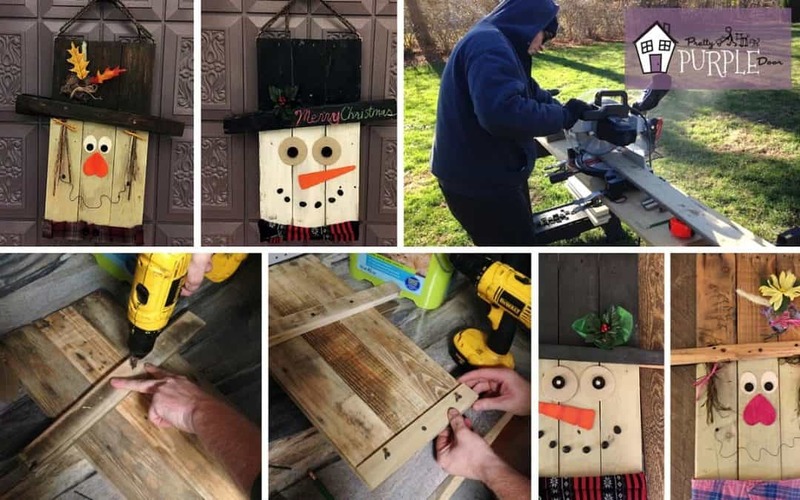 It’s a great way to transition from fall to winter without any hard work or storage. Just flip it over and you’re done! This project was really easy and fun. I just used my creativity to come up with the designs for these fellas. Aren’t they adorable? Paint – I used what I had on hand. White & Tan (watered down) , orange for the noses, and black chalkboard paint for the snowman hat. 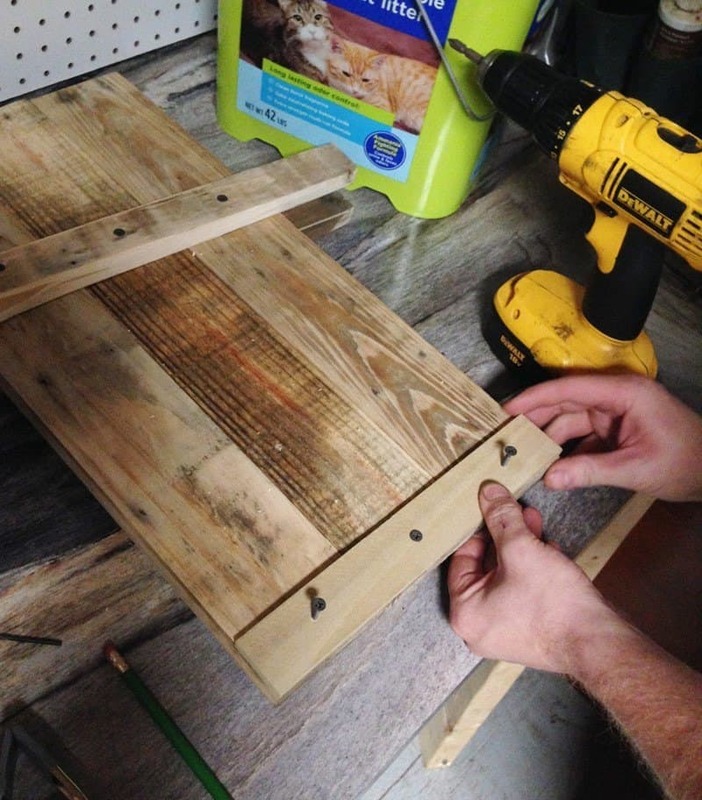 Make sure that you clean your pallet wood, and sand it down so that it’s nice and ready to paint. It will be difficult to work on if it’s not sanded. If you choose not to sand wear gloves and be very careful. You may get injured. Cut your 4th pallet piece vertically down the center to make the brim of the hat. Line your 3 pallet pieces up next to each other, and temporarily screw in your brim to figure out where you want your brim to be. You’ll want to mark your brim on both sides so that it’s exactly lined up with each other. I find it easier to remove this for painting then reassemble the door hanger later. Temporarily screw this in, then mark it. You’ll want to remove it for painting, etc. then be able to put it back in. 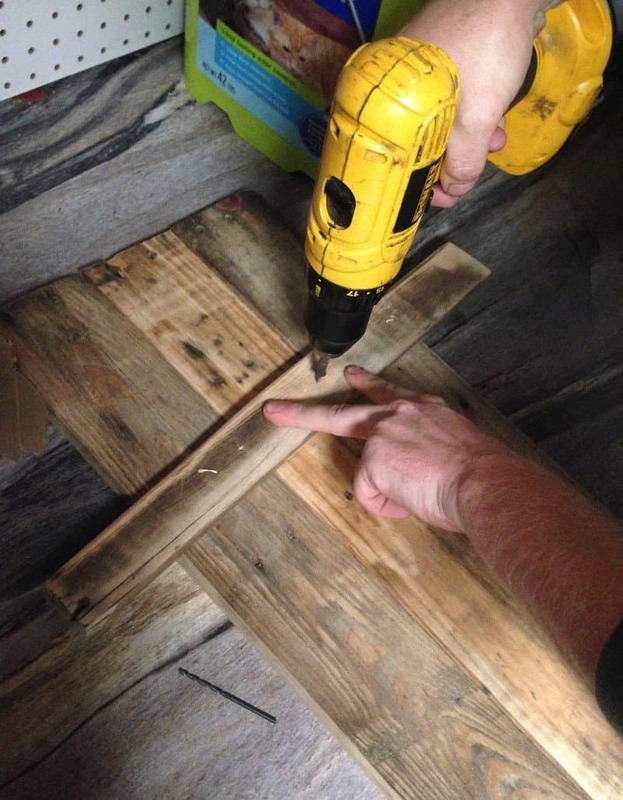 Attach the thinner wood piece along the bottom using screws. You can get away with one, or put this support piece on both sides — it should get covered by your scarf or scarecrow collar anyway. Add your collar and scarf. I cut up the collar from an old flannel shirt for my scarecrow. My scarf is a festive Christmas sock. I glued them on with the Weldbond glue. I just mixed some of the elements from the scarecrow collar, burlap and some leaves and twine to make a cute little decoration. I glue and stapled this in place. The snowman just got a simple little leaf/berry element since his whole hat is a chalkboard. I glued and stapled some “hair” onto my scarecrow. This is actually some dead flower pieces from my yard. I tied a little ribbon around the top to hide the staples and glue I used to fasten it. This was fun. For the scarecrow I used some wire and squiggled it around. I played with all sorts of materials before I came to this configuration. My snowman just has some black stones (remind me of coal), and a carrot nose. The black circles inside of the eyes are just bottle caps I spray painted black. Any kids in your life would be great at this part. Use your imagination. Use 1 X 100 D Ring Hanger w/ Screws or something similar to attach a hanger to the top. I ended up finding some cool rope at the dollar store and tied a slip knot in it so I could change the height at which it hangs. So what do you think? Pretty cool? No need to copy me on this one, seriously. I’d love to see your take on this. If you think reversible is too much, you can always make a one sided one. Don’t have pallets? Just use a single board or piece of plywood. Like to paint? Do it up! 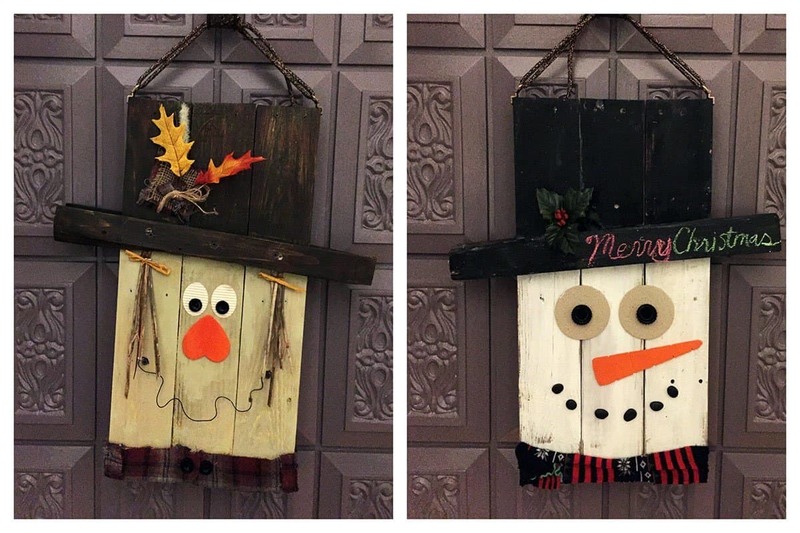 I think this is another really fun project that you can completely customize to your taste and style. Just thought I’d share it with you. 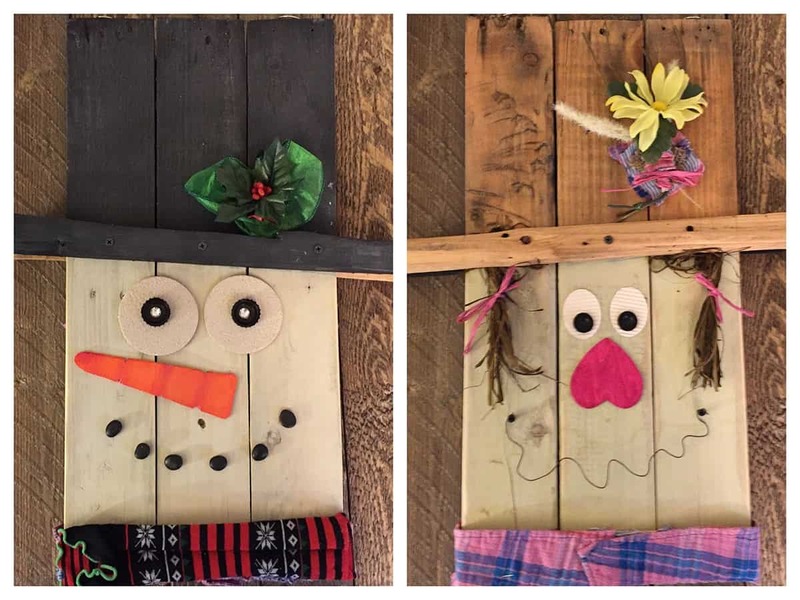 I just started selling handmade rustic home items like barnwood & pallet picture frames, wood slice wreaths, reclaimed wood tables, tile mosaics & more. We take custom orders and can also personalize your items. I'd love it if you'd check us out on Etsy or social media!